Looking for some late-night fun in DTLA? 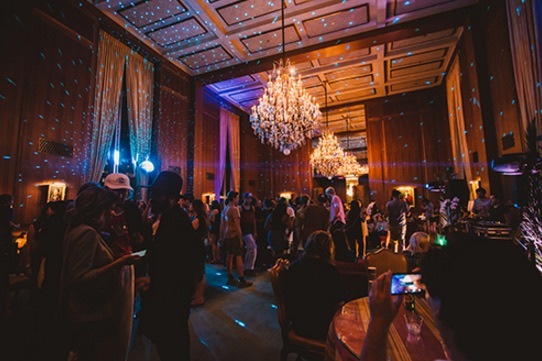 On Friday, February 5 come to the Music Center’s Dorothy Chandler Pavilion as the after-hours party series Sleepless returns for its third installment promising an extravaganza of sonic wonders that’ll delight guests until the wee hours of the morning (well, 3:00am at least). From multiple DJs and music performances, to video installations, fun activities, and sonic sculptures, there’s sure to be something for everyone at February’s shindig. Oh yeah, and did I mention it was free and open to the public? Check the full itinerary of activities below, then scroll down to the bottom of the article for your RSVP link. Kick iLA-based DJ collective, Mas Exitos brings the perfect blend of tropicalia, cumbia, psych, and Latin Breaks. A gold-tiled reflection pool featuring immersive video installation designed by Yu+Co on the backdrop of the ceiling’s 24-karat gold-leaf dome. Artist Daniel Gonzalez of Self-Help Graphics and Art’s shadow will create a puppet city-scape while making shadow versions of the busses, cars, trains, and street lamps that make up metropolitan Los Angeles. A unique sound installation designed exclusively for Sleepless by London-based label Touch featuring multi-channel audio works from Touch sound artists, Chris Watson, Jana Winderen, Bethan Parkes, Hildur Gudnadottir, The Eternal Chord, Philip Jeck, Simon Scott, BNilsen & drøne. View curated large-scale projections while lounging on pillows, cushions, and bean bags, OR bring your own soft seating (no chairs please). Move through the colors of the gilded “tunnel corridor” with curated music selections and light baths. DJs and electronic musicians from the artist roster of ESP Institute spinning tunes in The Founders Room. Video installations from Alexandra Pelly and lighting by Jon-Kyle Mohr. A special phone booth where you can dial up the Sleepless hotline for guided meditations by Diva Dompe and live music sessions from The Valley Sound. Cocktails and small bites will be available for purchase at the event. You can RSVP directly via this link to guarantee your free admission at 11:30pm. Even once the event has filled RSVPs, non-ticketed guests will be let in after midnight on a rolling basis. We spoke with the event organizers and they mentioned that given the popularity of this event extra efforts have been made to streamline the check-in process and limit wait times for those non-RSVP’d guests. For more information visit musiccenter.org.